From 1975 to 2005, Lebanon totally lost her Prosperity, Stability, Sovereignty, Independence and Freedom. The pattern of harassment, kidnappings and assassinations by PLO operatives and Syrians in Palestinian uniforms had been ongoing since the mid-1960s, when the PLO was founded, long before the events of 1968-1969 and 1975. Prior to the founding of the PLO, Syria's rejection of Lebanon's right to exist caused it to interfere in Lebanese affairs whenever it could: when on September 12, 1957 and May 3-8, 1958, a contingent of Internal Security Forces (ISF) was attacked and its members killed in Deir El Ashayer; when 200 Syrian soldiers attacked and occupied the village of Kfarchouba, in south Lebanon, killing the villagers and an officer; and when 5 customs officers were assassinated in cold blood at Masnaa, the crossing point at the Lebanese-Syrian border. From June to December 1958, the Lebanese Army lost 35 soldiers. Since that period, Palestinians/Syrians/ and later Syrian/Iranian organizations kidnapped, tortured, massacred, assassinated, slaughtered, raped and booby-trapped hundreds of innocent civilians, members of clergy, and Lebanese Army soldiers in the South, and all the areas of Lebanon. In the South, they attacked the villages of Jezzine, Kfarfalouss, Naqura, Bint Jbeil, Marjaayoun, Qoleiaa, Hasbaya, Debil, Deir Mimass, Ain El Mir, Roum, Anan, Shuwaya, Labaa, Rmeish, Kfarhouna, Aramta, Rihane, Ain Ebel, Beit Lif, Tebnine, Bkassine, Aytoula, El Taybeh, Sabbah, Houla, and in other regions of the South. They burned down and razed to the ground houses, churches, schools, the only two available hospitals, and entire villages, to occupy the remaining (8%) of Lebanese territory that was still free in 2000 from the Syrian/Palestinian/Iranian occupation. The goal was to undermine the state of lull between Lebanon and Israel, forcing Lebanon to remain until this day the only active war front against Israel under their unique control - from Fatahland to Hezbolland. An Officer of the South Lebanese Army reported to the media that between 1978 and 2000, 621 SLA soldiers and 200 southern civilians were killed and assassinated - a total of 821 fatalities - while 230 soldiers and 80 civilians, a combined figure of 310, were maimed. It was later confirmed that between the first attack and 2000, the overall number of victims was indeed 1630 persons. The Lebanese Army units, known as the SLA (South Lebanese Army), were officially dispatched to the South in 1976 and were composed of a nucleus of 600 regular Lebanese Army soldiers. They were cut off from the central government of Beirut by the PLO and by renegade units of the Lebanese Army called "The Arab Army of Lebanon" under the command of the deserter Lieutenant Ahmed Al Khatib. However, the South Lebanese Army remained on the payroll of the Lebanese Army at Yarzé and of the government until May 2000. When the Syrians completed the takeover of the country in 1990, the SLA remained loyal to the pledge of defending their country for decades, even after their own government that was under Syrian control branded them as the enemy. The Beirut Government officially designated and included over the years the Commanding officers Saad Haddad, Sami Chidiac, and Antoine Lahad (unofficially designated-see below), and appointed the Officers Sharbel Barakat, Samir El Hajj, Eid Eid, Adnan El Homsi, George Zaatar, Rizkallah El Fehaily, Hanna El Hajj and others, to assist them in the South. The number of soldiers was 3000 and even reached up to 5000, at the peak of their history. The inhabitants of the region joined the South Lebanese Army to defend their regions against Syro/Palestino/Iranian invasions, in the way that the inhabitants of Beirut in 1989 joined PM General Aoun and his Army in defending their regions in the War of Liberation. In 1976, the South Lebanese Army was known by its first name as The Army of the Free Lebanon (Jeysh Lebnaan el Horr). keeping the official status of the lull between Lebanon and Israel in order to avoid deterioration in the entire region into a Lebanese-Israeli war. Major Saad Haddad was also the Government’s official representative regarding all diplomatic contacts with the United Nations’ envoys in the South. Between 1979 and 1982, the Syrians pressured President Elias Sarkis and Prime Minister Selim Hoss to charge Major Saad Haddad and the SLA with high treason, starting by cutting off their pay. The pressure became even more intense with the attempt to replace the South Lebanon Army by a Lebanese Army division called Qawqaba, operating under Syrian control. Ever more so, Major Saad Haddad rejected any collaboration with the Syrian Regime. Kurt Waldheim, Secretary General of the United Nations and General Erskin, Commander of the UNIFIL, who were asked by the Lebanese Government to keep official contacts ongoing with Major Saad Haddad, publicly criticized the Government for its contradictory and ambiguous position towards Major Saad Haddad’s legitimacy. After the death of Major Saad Haddad in January 1984 the Command of the Lebanese Army of Yarzé, along with (former) President Camille Chamoun’s support, informally selected retired General Antoine Lahad as Commander of the South Lebanon Army. They assigned General Lahad to fill in the gap until United Nations’ Resolutions 425 and 520, related to the redeployment of the Lebanese Army in the South and all Lebanese territory, were implemented. 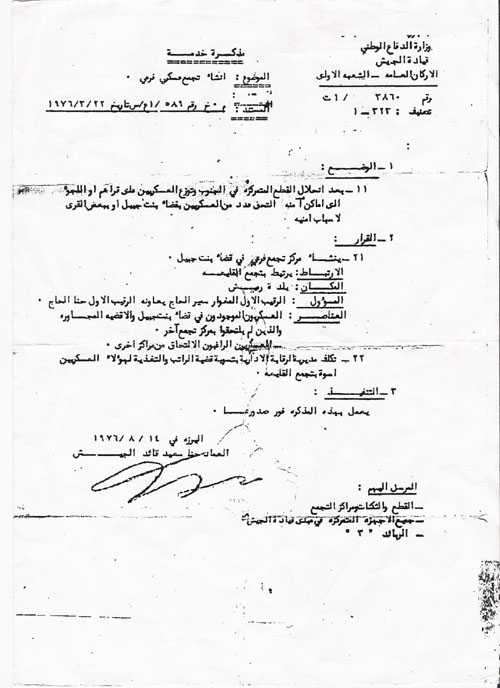 The Command of the Army paid the SLA’s salaries from 1976 to 2000, with the exception of the years 1979 to 1982 (the Hoss-Sarkis period), though the Commander of the ISF refused to block the payments. 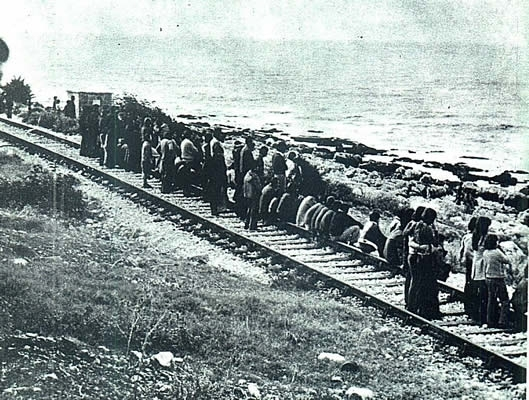 Moreover, whenever the roads between Marjaayoun and Beirut were inaccessible and other means of transportation were quite impossible for allocating SLA’s wages and logistic supplies, the officer in charge, assigned by the Command of the Army of Yarzé, would reach Marjaayoun by sea through the port of Haifa in Israel. Following Presidential advice, the South Lebanon Army opened the road to Israel for the sole purpose of survival and humanitarian needs (lack of hospitals, starvation, illnesses….) and in no case for purposes of collaboration. President Sleiman Franjiyeh gave the instruction and the right to use the only open door to Israel. He had no other alternative: either to leave the Southerners to die and succumb to diseases, injuries, starvation…or to save them, allowing them to access Israel’s borders. President Franjiyeh based his conscious choice solely on a principled perspective. In fact, the SLA included over time Lebanese soldiers from the various communities – Christians, Druzes, and Shiites – thereby reflecting the comprehensive character of the single Lebanese nationality. 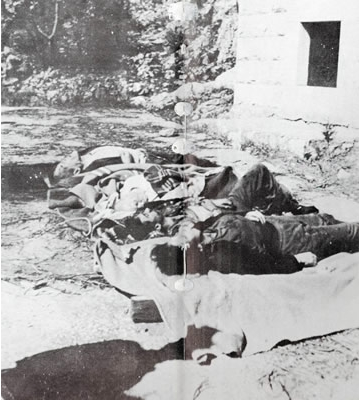 September 1957 to May 1958 – Syrian soldiers attacked and occupied the village of Kfarchouba in South Lebanon, killing the villagers and an officer. 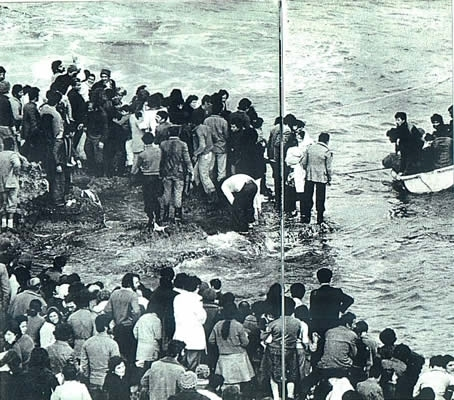 February 26, 1975 – A Palestinian gunman infiltrated a crowd of Lebanese anglers demonstrating in the streets of Saida-Sidon, south Lebanon, and attacked a patrol of the Lebanese Army in charge of maintaining order. A corporal was killed and two soldiers were wounded. 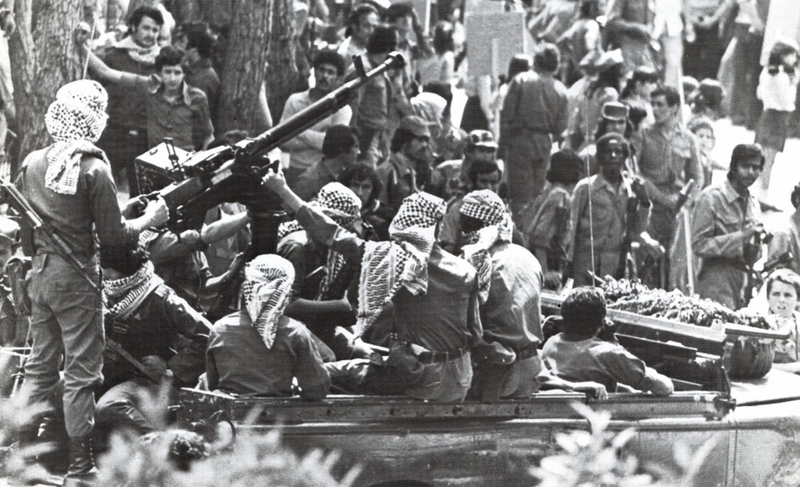 February 28 to March 2, 1975 – Palestinians and the Saika Organization deployed in the city of Saida-Sidon twice attacked a Lebanese Army convoy along the main artery of the city. Six soldiers were killed, 40 others were wounded with nine civilians among them. 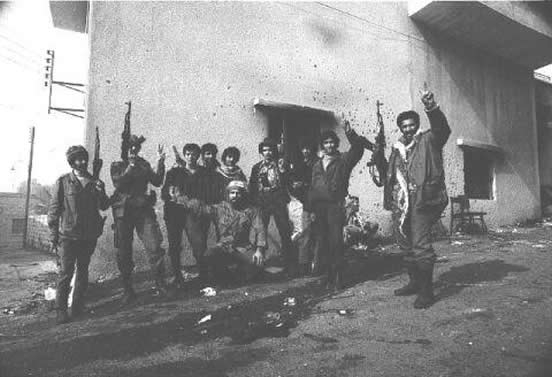 March 10, 1976 – Fatah Organization, the renegade troops of Lieutenant Ahmad Khatib's Arab Army sponsored by the Syrian regime, their allies and the Saika Organization, attacked the Lebanese Army barracks in Khyam, South Lebanon and executed over 30 Lebanese soldiers in cold blood. They attacked and surrounded the whole region: Marjaayoun, Qoleiaa, Bint Jbeil, Al Taybeh, etc…, blockaded all medical supplies, food provisions and military support from entering the region. They kidnapped civilians, killed innocents, and raped women and girls. The Lebanese Army barracks in Marjaayoun and other regions were consequently falling, the soldiers were fleeing to more secure places, and those who tried to reach the Ministry of Defense in Yarzé were sent back to the south; people were starving or dying from ill-treatment and serious wounds. March 22, 1976 – The Army Commander-in-Chief, General Hanna Said, signed a Communiqué issued from the Ministry of National Defense, Army Dep. - Yarzé, to restructure the Lebanese Army’s posts deserted in the South. This notice was distributed and implemented on August 14, 1976. (See original Document – last page). 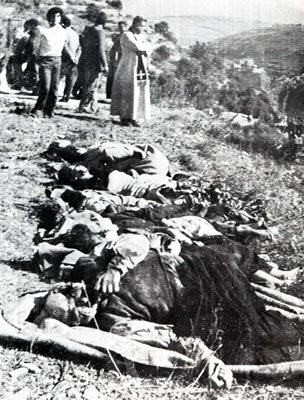 August 1, 1976 – Fatah, Saika Organization and their allies attacked the village of Jezzine, South Lebanon. Two were killed, tens were injured and hundreds were forced into exile. October 19 to 21, 1976 – Fatah, Saika Organization and their allies attacked the village ofAishiyeh in the South and committed mass murder and atrocities, as part of the Syrian Regime’s ethnic cleansing campaign. More than 70 innocent people were killed and 100 seriously wounded. The majority of the victims were women, children and the elderly. Women and girls were raped, then slaughtered inside the church. Newborns were ripped apart. Children were decapitated with hatchets. Houses were burned down. The rest of the village residents escaped to safety in a neighboring region. Francis Alfred Nasr was burned alive in front of his father's eyes. 1. Francis Alfred Nasr (burned alive). 3. Fouad Gerges Najem (plus his wife and four children). 21. Tony Ibrahim Nasr (14 years old). 24. Selim Jamil Nasr (16 years old). 29. Fouad Youssef Nasr (newborn). 30. Toufic Nasr (70 years old). 31. Melhem Ephrem Ephrem (45 years old). 32. Sleiman Ephrem (25 years old). 34. Raymond Ibrahim Aoun (15 years old). 36. Soldier Youssef Elias Abu Kheir (Executed in the church). 38. Pierre Naamtallah Jabbour (13 years old, executed in the church). 41. Fayez Najem and his two daughters (five and three years old). From March 76 to September 23, 1978 – Fatah and the Saika Organization with Ahmad Khatib's Arab Army and their allies kept brutally shelling and targeting from Khyam and Tallet El Shrayqe the villages of Marjaayoun, Qoleiaa and others, killing and wounding tens of innocents. Yasser Arafat (Abu Ammar) personally supervised from Shuwaya the operations of Fatah against Marjaayoun and Qoleiaa. September 23-24, 1978 - The (South) Lebanese Army led by Major Saad Haddad counter-attacked Tallet El Shrayqe, then Khyam, and finally liberated them. However, the war against the Lebanese Army and the civilians rolled on. April 18, 1979 – Under the pressure and persistent demand of the Syrian Regime, Major Saad Haddad was removed from office, and then called to justice by Presidential Decree No. 1942, from President Elias Sarkis. It was a new Syrian attempt to invade the South. April 18, 1979 – Major Saad Haddad, aware of the Syrian conspiracy, declared the South of Lebanon to be ‘The State of the Free Independent Lebanon” (Dawlet Lebnaan El Horr El Mest’ell), with Beirut as capital. From 1979 to 1982 – After the Accord of Beit-El Din in early 1979, and until the end of President Sarkis’ mandate in 1982, the South Lebanon Army’s salaries were all suspended. At President Bashir Gemayel’s order, salaries and rights were all reinstituted, until the year 1997 for some and the year 2000 and beyond for others. January 30, 1982 – A booby-trapped car exploded at Saida-Sidon in South Lebanon, killing one civilian and injuring another. October 14, 1982 - A booby-trapped car exploded at a check post of the South Lebanon Army in Jdeidet Marjaayoun in south Lebanon, killing three soldiers and wounding 40 civilians. January 4, 1984 – Major Saad Haddad won his trial and regained all his rights, decorations and official rank. January 16, 1984 – Major Saad Haddad died and his funeral was officially conducted. The population, his political friends and army veterans paid him tribute as a National Hero. January 1984 – Retired General Antoine Lahad, supported by President Camille Chamoun, was informally selected by the Command of the Lebanese Army of Yarzé as the Head of the South Lebanon Army’s Command. They remunerated him with a higher salary, going from the “Sareff Salary” to the “Taawiid Salary”. July 10, 1984 – The Mayor of Sarafand, Jawad Khalifeh, was assassinated in South Lebanon. September 19, 1984 – Syrians and Palestinians ambushed a South Lebanon Army unit on their way, in the village of Sohmor in the west Bekaa, killing five soldiers and wounding five others. March 6, 1985 – Hezbollah, a Syrian/Iranian sponsored Organization, attacked Rashaya in South Lebanon. Two were killed and tens were injured. June 30, 1985 – Hezbollah, a Syrian/Iranian sponsored Organization, attacked Zaghraya-Sidon, in South Lebanon. Mustafa Khalil, Abdel Raouf El Hajj and Mahmoud Haffouda were killed. March 5, 1986 – A booby-trapped car exploded in Saida-Sidon. Two civilians were killed and three were injured. May 12, 1986 – A booby-trapped car exploded in Saida-Sidon. Two civilians were killed and another two were injured. 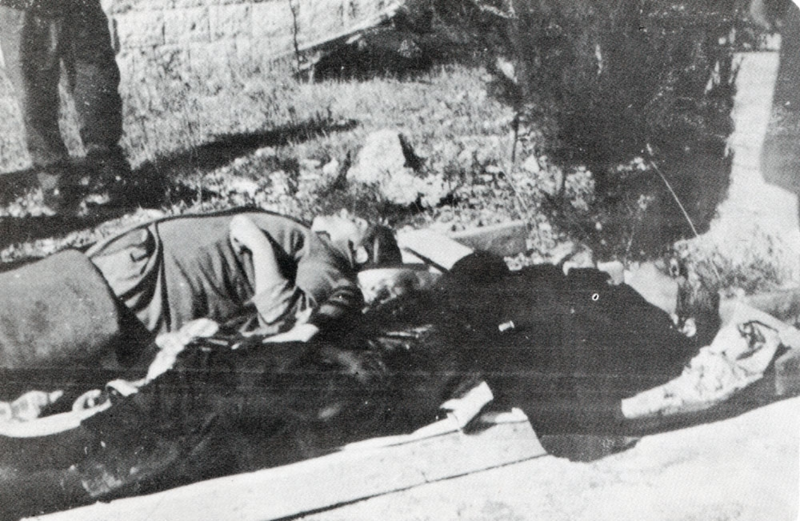 May 24, 1986 – Syrian agents riddled the body of Father Boutros Abi Akl, 62-years old, with bullets. He was shot dead on his way to Cadmus School in Tyre, South Lebanon. July 6, 1990 – Hezbollah, a Syrian/Iranian sponsored Organization, murdered U.S. Marine LT-Col. William R. Higgins, who was serving as Chief Observer with the United Nations Truce Supervisory Organization (UNTSO) in southern Lebanon. He had been kidnapped on February 17, 1988 from a U.N. Peacekeeping vehicle driving south from the port city of Tyre towards the town of Naqura. Colonel Higgins was tortured before being hanged. His murder was video-taped and released for public viewing by the murderers, before dumping his body on to a public road. His remains were eventually returned to the United States and were interred in Quantico National Cemetery on December 30, 1991. November 9, 1998 – Hezbollah, a Syrian/Iranian sponsored Organization, planted an explosive charge on the Ain Majdalain-Niha Road in Jezzine, South Lebanon. Four Lebanese soldiers were killed and one other was seriously injured. June 8, 1999 – Two Syrian/Palestinian agents assassinated three judges and one Prosecutor in Saida's Supreme Court. Hassan Osman, Walid Harmoush, Imad Chehab and Assem Abu Daher were murdered in view of dozens of witnesses. The two gunmen fled to the Ain el Helwe Palestinian military camp. It was yet another Syrian warning in an attempt to subdue the Judicial system. September 22, 1999 – Hezbollah, a Syrian/Iranian sponsored Organization, planted an explosive charge in Kfar Houneh, South Lebanon, killing two Lebanese soldiers. September 28, 1999 – Hezbollah, a Syrian/Iranian sponsored Organization, detonated a roadside bomb in South Lebanon. One Lebanese officer with his driver was killed and dozens were seriously injured and maimed. March 2, 2000 – Hezbollah, a Syrian/Iranian sponsored Organization, planted an explosive charge in South Lebanon. One Lebanese soldier was killed and dozens were seriously injured. 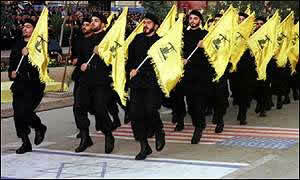 March 3, 2000 – Hezbollah, a Syrian/Iranian sponsored Organization, detonated a roadside bomb in South Lebanon. Six Lebanese soldiers were killed in their military vehicle and four civilians were seriously injured. May 26, 2000 – After the Israeli withdrawal, Hassan Nasrallah, Secretary-General of Hezbollah, a Syrian/Iranian sponsored Organization, threatened to slaughter the Southerners in their beds while sleeping. All Lebanese Radios and TV channels broadcast Nasrallah’s threats. Thousand of Southerners fled to Israel while an estimated 2,300 residents, who could not escape, surrendered. They were taken into custody by Hezbollah guerrillas and Lebanese security forces, then to interrogation, torture and detention camps under Hezbollah Organization, Syrian and Lebanese military intelligence control, for several days, before being handed over to the Authorities. Most of the detainees were transferred to Lebanon's Permanent Military Court (PMC), that Amnesty International called "travesties of justice", while others basically "disappeared." Hezbollah’s secretary-general at a rally in Haret Hreiq, also warned against clemency toward "militiamen" who served in the South Lebanon Army during the occupation, saying they would have to either be locked up in rehabilitation centers or sent abroad, but not allowed back to southern villages. The Government Commissioner, Justice Nasri Lahoud, declared before the Military Court, that 2277 was the total number of the defendants charged with minor or major collaboration with the enemy. Some of the detainees later reported to having been beaten during their detention; many said that they were forced to lie with their hands cuffed behind their backs for up to 24 hours. C.T. (personal interview) was brutally tortured, his lower face disfigured and his jaw busted. On his way out, he had to endure plastic surgery to restructure his jaw. Georges Said, a 72-year old diabetic, died on June 28 after prison officials took away his Israeli-made medication. Abu Samira, a 70-year-old man, and 65-year Ramez Boulos, from Qoleiaa, both died under torture and ill-treatment. Abu Samira died in Oberly’s Jail; Ramez Boulossuccumbed at home, after they released him agonizing from ill-treatment, in Roumieh’s prison. In the 8th session of the Permanent Military Court, Zakharia Fadlallah Jumaa, a platoon Commander of the SLA, alluded to torture administered on him while in custody, in the pre-trial period at the Oberly center. The allegations of torture made no impression on the bench. In the 10th session of the Permanent Military Court, Hussein Zein Al Abidin said:” I was beaten up and heard frightening cries, which forced me to confess that I fed the SLA security network”; another said that he wasn’t beaten but just suspended from above for not answering a question, then lowered down. In the 11th session, the court ignored the allegations of Hanna Karim Al Alam who claimed that he was tortured, pointing out to the Court the pus and bloodstained bandages around his leg, and that he was denied any kind of medical treatment for five days. All those who were released after completing their sentences in prisons were deprived of their civil and social rights, until this day; those who were set free by the court like Mohammad Ayoub Faris (in Houla) and Mohammad Bassam (in Aytaroun) were beaten to death (according to unconfirmed reports, said FHHRL). According to Al-Hayat newspaper and re-published by The Middle East Intelligence Bulletin, 20 people were seized in the village of Aytaroun on June 7; five were later released by Hezbollah, but the others were still missing. Human rights groups constantly appealed for their release, but Hezbollah officials claimed to have "no information on the subject." At Roumieh Prison, where most of the prisoners were being held, it was reported to the Foundation for Human and Humanitarian Rights-Lebanon (FHHRL) that "many of the detainees had bruises when they were brought in." Meanwhile in the South, there was looting, sacking and then blasting deserted houses in Marjaayoun, Bourj El Moulouq, Qoleiaa, Debil and Rmeish, which alarmed and terrorized the rest of the villagers; in Beit Leef, Aytaroun and Houla the villagers were threatened, beaten and sometimes kidnapped. February 10, 2001 – Hezbollah, a Syrian/Iranian sponsored Organization, desecrated the cemetery of the Shiite village of Aytaroun in South Lebanon. They dug out 17 soldier's corpses of the South Lebanon Army from their graves, considered, according to Hezbollah, as traitors. July 11, 2002 – At 9:30 pm, the Palestinian Badih Hamadeh, alias Abu Obeida, from the Palestinian military camp of Ain El Helwe in South Lebanon, attacked a division of the Lebanese Army and shot three servicemen. November 21, 2002 – At 7:30 am, a Syrian/ Iranian agent assassinated 31-year old American nurse/Christian missionary, Bonnie Penner-Witheral, in Saida-Sidon. She was found with a bullet in the head and two others in the chest. It was a Syrian warning against America’s new policy in the Middle East, and to create new internal conflict among the Lebanese communities. Today, the rest of the SLA soldiers are in enforced Exile, having to pay the price for their actions in discharging their duty - acts of loyalty, honor, dignity, patriotism and self-defense, and stand before the “Justice”! I sincerely regret not having listed all the victims and martyrs’ names. All the names appearing in this compilation, were obtained from newspaper reports, archives, and witness accounts, friends or families sources. Akiki (PVT - Debil, January 31, 2000). Fawzi El Saghir (PVT - September 28, 1999). Milia Naaman Rashed (72 years old - Jezzine). Maroun Neehme Neehme (67 years old Qoleiaa). Salima Neehme (60 years old - Qoleiaa). Youssef Massoud Rizk (Jezzine - August 20, 1976). Tanios El Tenn (Rmeish - September 1976). Hanne Michael El Haddad (Ain Ebel - July 1976). Michael El Haddad (Ain Ebel - July 1976). Joseph El Haddad (Ain Ebel - July 1976). Mona Youssef Chbat (Ain Ebel - September 1975). Youssef Tanios Salloum (Ain Ebel - June 1977). Youssef Gerges Nassif (Debil - February 1977). Boutros Michael El Akh (Ain Ebel - September 1975). George Gerges (Jezzine, April 1998). Tony Kfoury (Rashaya - March 6, 1985). Mustafa Khalil (Zoghdraya-Sidon - June 6, 1985). Abdel Raouf El Hajj (Sidon - June 30, 1985). Mahmoud Hafouda (Sidon - June 30, 1985). Sleiman El Asmar (Sidon - August 30, 1985). Maroun Matar (January 22, 1986). Wadih Moussa (Jabal Safi - February 14, 1986). Philip Moussa (Jabal Safi - February 14, 1986). Khalil Trabulsi (Ayneta - February 17, 1986). Jihad Saykali (Rihane - June 20, 1986). Antoine Abu Ghannam (Yater Road - June 15, 1986). Assaad Moussa (Labaa-Kfarfalouss-Ain El Mir - June 19, 1986). Edgard Hakim (Darb El Sim - June 20, 1986). Dani Najm (Sabbah-Jezzine - July 5, 1986). Lucien Estephan (Tallet Sejod - August 10, 1986). Khalil El Jellad (Tallet Sejod - September 18, 1986). Joseph Youssef (Tallet Sejod - September 18, 1986). Elie Youssef (Anan Kfarfalouss - June 1986). Charbel Kassouf (Jabal Safi - April 1987). Jad Morkos (Anan-Kfarfalouss - September 1987). Youssef Matta (Jabal Safi - October 1991). Tony Hourani (Ain Majdalain-Jezzine - May 1992). Tony Bakhos (Kroum el Arz-Jezzine - October 1995). Assaad Nammour (Sabbah-Bkassine - September 1996). Hussein El Fkih (Sabbah-Bkassine - September 1996). Selim Risha (Roum-Bessry - December 1996). Samir Youssef Roumiyeh (Kfarhouna - March 1997). George Gerges (Jezzine- April 1998). Roukoz Roukoz (Ain Majdalain-Jezzine - September 1998). Joseph Chamoun (Ain Majdalain-Jezzine - September 1998). Two students (Anan-Roum Road - 1988). Two students (Kfarhouna-Jezzine - 1997). Ezzat Elias Julien, his mother, wife and three (3) children (Qoleiaa). After the dissolution of the section established in the South and the distribution of the soldiers in their villages or their refuge to safer regions, a number of soldiers joined the District of Bent Jbeil and a few villages for security matters. 21 – Create a regrouping quarter in the District of Bent Jbeil. Person in charge: Sergeant Commando, Samir el Hajj assisted by Sergeant Hanna El Hajj. and those who did not join any assembly quarter yet. - The soldiers from other quarters who wish to join it. 22 - The Administrative Control Directorate undertakes to facilitate the salary phase and food provision similar to those soldiers under Qoleiaa regrouping command. Will take effect at the publication of this communiqué. General Hanna Said, Army Commander-in-Chief. Sakr Etienne (Abu Arz), born in Ain Ebel, South Lebanon, President of the Guardians of the Cedars - Lebanese National Movement – Interviews: in Jezzine, 1992 and in Exile, from 2001 to 2006. A Permanent Synchronization on the exile Dossier was established since that day. A permanent Synchronizing was established since that day. Interviews: May 31st, and June 1st 2000, then 10 days later. Foundation for Human and Humanitarian Rights-Lebanon (FHHRL) Report # 6 – June 9, 2000 ; Report # 7- June 17, 2000; Report # 8 - June 2000; Report # 10 - June 26, 2000; Report # 12- June 28, 2000; Report # 15 - July 12, 2000; Report #8 – June 19, 2000. Foundation for Human and Humanitarian Rights-Lebanon (FHHRL) Press Release, June 6, 2000; June 15, 2000. Amnesty International Press Release, 21 June 2000. 2000 Middle East Intelligence Bulletin, South Lebanese Face Abductions, Torture and 90-Second Show Trials. Sakr Etienne (Abu Arz), South Lebanon Declaration, May 22, 2000: http://www.gotc-se.org (Bulletins/ Previous Communiqués). Al-Hayat, London, June 9, 2000. The Daily Star, Beirut, June 26, 2000. L'Orient-Le Jour, Beirut, 6 Juin, 2000. Lebanese Ministry of Foreign Affairs, Le Livre Blanc, 1976 – Hafez el Assad Speech, July 20, 1976- p.120; p.122; p.137; p.140. Wehbeh, L., Houwala El Abbtal, 1975-1976 - Beirut. Tanios, Edward Antonios & Honein Edward, Emmahatouna El Batalat, 1975/1982 - Beirut. Chamoun, Camille, Crise au Liban, Imprimerie Catholique : Beirut, 1977. Chamoun, Camille, Mémoires et Souvenirs, p.273 : June 11, 1978; p.313 : August 14, 1978; p.314 : August 16, 1978, Imprimerie Catholique : Beirut, 1979. Nasr, Nicolas, Faillite Syrienne Au Liban, Beirut: Dar El Amal, Tome I - Tome II. Centre Libanais D'Information, La Guerre Libano-Palestinienne ou Comment une poignée de jeunes firent Echec aux jeux des Nations. http://www.state.gov/r/pa/ho/pubs/fs/5902.htm - (U.S. Department of State, Office of the Historian, Bureau of Public Affairs, “Significant Terrorist Incidents, 1961-2003: A Brief Chronology”). Centre Catholique d'Information, Images et Chronologie de la Guerre du Liban - Dar El Massira.